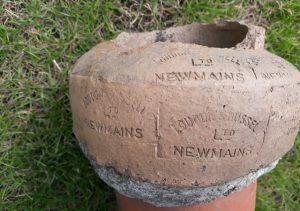 Found at Castlecary and kindly donated by John Crozier. 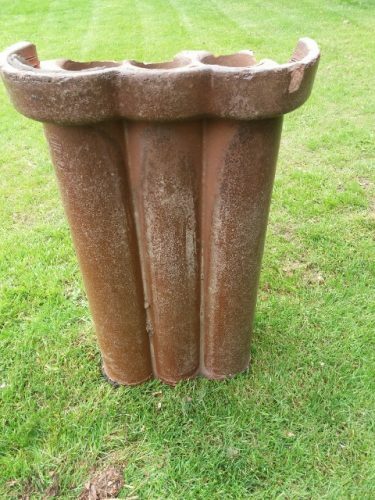 This is a 6 chambered ensemble and I think it may be for service cables such as BT rather than sewer or water but I am not sure. It measures 32″ long, 18 1/2 x 13 1/2 inches at widest points ( across the broken lip). Each large channel is 4 1/4″ in diameter and the small openings are 1 1/4″ in diameter. 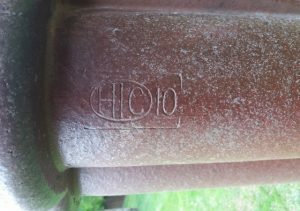 It is marked HIC 10 which I believe was once the trademark of Hepworth Iron Company. I am uncertain if this was manufactured in Scotland or elsewhere. 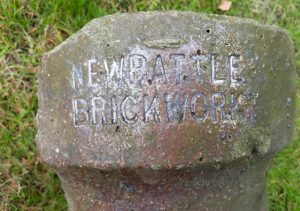 Hepworths swallowed up a good number of Scottish Companies. 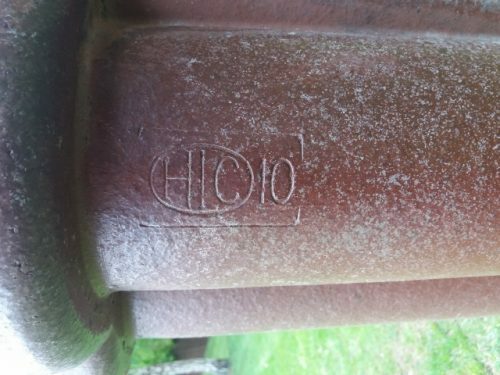 – GR – Stein among others was a member of the Hepworth Ceramics Group. Hepworth Iron Co, manufacturer of clay products including bricks, of Hepworth, Yorkshire. 1921 Contract from General Post Office for supply of clay conduits for telephone cables underground; company then concentrated on salt glazed pipes and sanitary pipes. 1952 Hepworth Iron Co (Engineering) Ltd incorporated as a subsidiary engaged in high precision engineering and manufacture of hydraulic equipment. 1954 Hepworth Refractories Ltd incorporated as a subsidiary to take over the manufacture of products for steel foundries. 1959 Converted into a public company again. 1960 Acquired Albion Clay Co and Herbert Heaton (Clayware) Ltd.
1961 Acquired 2 more pipe makers Fred Temperley and Sons Ltd and J. Duckett and Son Ltd. Acquired through subsidiaries Herbert Brook (Fireclay) Ltd and La Brecque Engineering Co Ltd.
1962 Acquired old established pipe maker Thomas Knowles Ltd. Acquired 80% of the shares of Lochside Coal and Fireclay Ltd.
1963 Acquired North Bitchburn Fireclay and 75% of John Crankshaw Co of Horwich; JV formed with a Dutch company to market rigid PVC products in the UK. Had invested in a new large clay piping making facility. 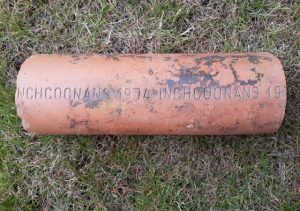 1969 Acquired pipe interests from Doulton pottery group. The tunnel kiln capacity had doubled due to acquisitions and internal investment. Discussions with General Refractories about a merger; would create a large clay-using group from the 2 largely complementary companies. 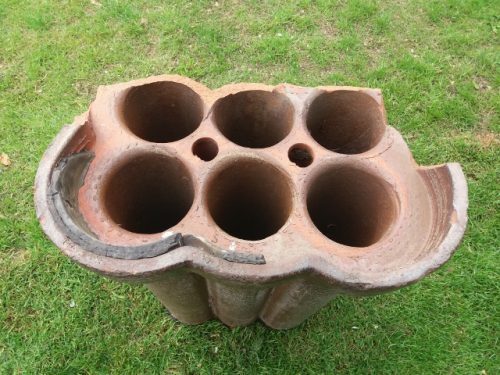 Hepworth had grown rapidly through investment in tunnel kilns and by acquiring companies which could be improved in that way, and companies with major clay assets. 1970 New company Hepworth Ceramic Holdings formed as holding company for the merged companies. 1970 Acquired the TP drainage and sheetlines businesses from Thermo Plastics. 1972 Hepworth Ceramic bought James Oakes and Co maker of clay pipes, cable conduits and sulphuric acid. 1972 Acquired Fordath Ltd, which complemented the industrial sands business. 1987 Acquired Tube Investments home heating division, consisting of Glow Worm Boilers and Parkray. 1988 Acquired Henderson Group, garage door manufacturers. Below – 30/10/1841 – Carlisle Journal – Article on land draining in Ayrshire. 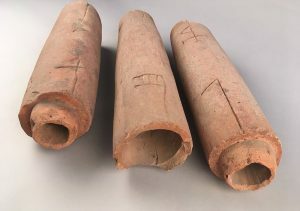 Early drain ‘tubes’ were made at Drongan Pottery. 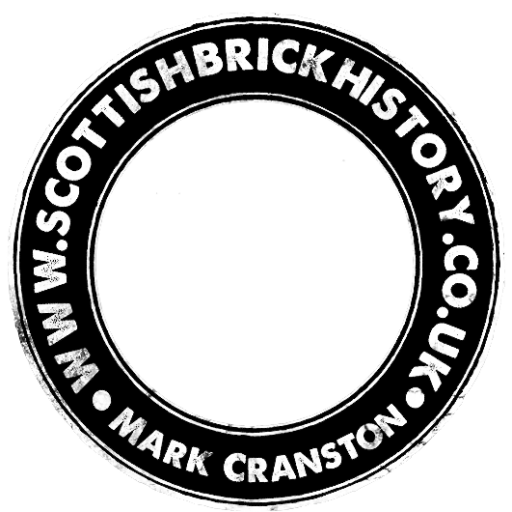 The article describes various methods for creating a drain and states that in 1841, Ayrshire could boast 54 Tileworks. . .